Battle solo or with a group of friends against an onslaught of enemy vehicles! Make your way across the Hex map, making use of the weapons and armour at your disposal. Here are 5 essential tips to allow for a smoother approach to mission progression. 1. Boosting Drains your shields. Holding the acceleration button makes you go faster. While moving at this boosted speed your shields constantly drain. Use it sparingly. 2. You’re always making progress. You’ll unlock new weapons at the end of some missions. These weapons will start appearing in supply point hexes from that moment onward. They stay unlocked even if you fail a campaign. Check how many you’ve unlocked in your arsenal. 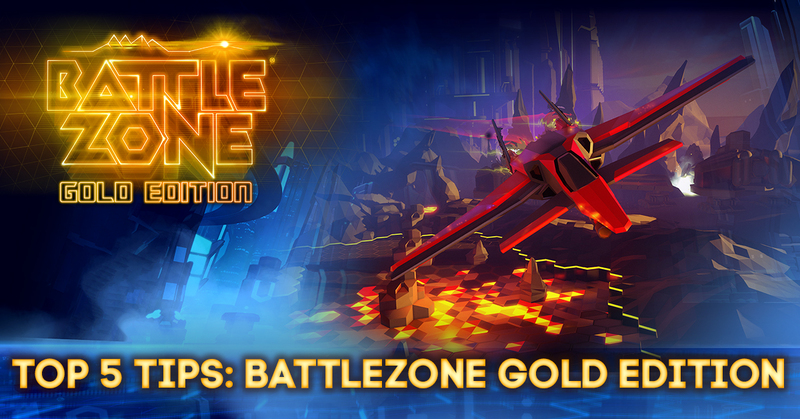 Battlezone is a gruelling duel against innumerable robotic foes. You’re going to die a lot. Try an easier difficulty until you’ve got the hang of things. 5. Check for support buildings. Each battlezone contains a support building. Find and convert it to unlock weapons, earn data or keep the enemy power level in check.